The Georgia Tech Amateur Radio Club is located in the Electrical Engineering Building, on the campus of the Georgia Institute of Technology, located in NW Atlanta, GA. We operate a 2-Meter FM repeater, a 70cm DStar repeater and a shack of various HF, VHF, and UHF equipment. Our primary purpose is to provide a means for students of Georgia Tech to operate, but we are open to faculty, staff, and students. The shack where the club keeps its equipment has moved all over campus. Sherman Banks, W4ATL, recently put together a map of these locations. W4AQL played an important role during the disastrous 1985 Mexican Earthquake. On that fateful day, a member of the club was sitting in the club station when he got a phone call from one of the local network-affiliates. The reporter knew of the earthquake but all phone lines were knocked out so no information about the damage could get out. Well, tuning around a little bit, the Tech student found a station from Mexico City. Needless to say, this was a very popular thing that garnered all sorts of national attention for the radio club. I was told that there was some additional, major, coverage due to the fact CNN is based in Atlanta as well. Georgia Tech's other accomplishments include assistance with the 1988 Hurricane Gilbert in Jamaica and the 1989 Hurricane Hugo in South Carolina. More recently, the club was called on for radio communications to Jamaica and Florida during the 2004 hurricanes, Frances, Ivan, and Jeanne. The great thing about history is that the story changes as more details are learned. That said, I'm sure that the history of the club will change as more details come in from past and present club members, as well as those associated with the club. The Georgia Tech Amateur Radio Club was founded in 1910 by a group of seniors. The club was initially assigned the call “4XG”—which signified the general region of the club (4), the fact that it was “experimental” (X), and was located in Georgia (G). It operated with fun radio equipment like spark-gap generators and other entertaining, if not dangerous, gear until the station was shut down for World War I (as was every other amateur radio station). After the war, the club received the call W4YA, which was in a group reserved for educational institutions (the “Y” part, and the first one “A” in the call area “4”). The club continued with this call, while at the same time using the call 4AV. 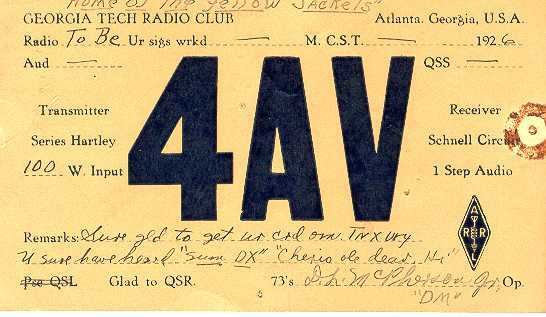 This QSL card from May, 1926 was recently found showing the callsign at the time to be 4AV. Until the discovery of this QSL card, the concurrently used callsign was unknown. Eventually the club began doing a lot of operating with the call W4AQL, which belonged to a member of the club. After he graduated from Tech, he arranged to have the call remain here so that it could continue to be associated with the club station. That's the story of our callsign. Kinda cool. There are two sets of photographs that were found and scanned by Sherman Banks, W4ATL, that document club history. The first is a set of photos from 1987 when the club received a large donation of equipment from Buzz Reeves, K2GL (SK). These photos were taken when club members traveled to New York to pick up the equipment. The second set was taken during the 1990 November Sweepstakes. To see the 1998 revision of the club constitution, click here.